MB7VV uses a retail purchased Diamond X50NA dual band antenna. • Emergency spare antenna for GB3BS/GB7BS if the main antenna fails. • 200w Maximum power rating. The antenna system is mounted 7m A.G.L. on a set of T/K brackets. The coaxial feeder is 20m of CLF400 low loss cable. • Terminated with pre-crimped N-Type connectors. Physical construction of CLF400 cable. • Inner conductor: Copper covered Aluminium wire. 2.77mm O.D. • Dielectric: Gas injected Foamed Polyethylene 7.24mm O.D. 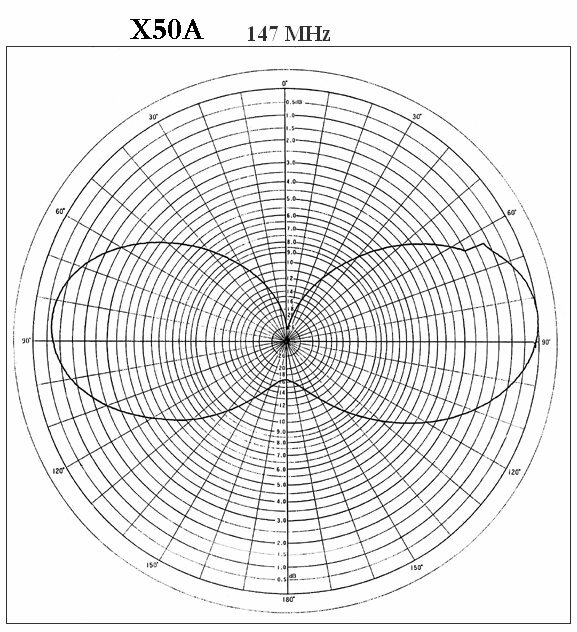 E-Plane plot for VHF. Remember it is an Omni Directional antenna!